This article is about the year 1865. Wikimedia Commons has media related to 1865. January 15: Union captures Fort Fisher. January 4 – The New York Stock Exchange opens its first permanent headquarters at 10-12 Broad near Wall Street, in New York City. January 13 – American Civil War – Second Battle of Fort Fisher: United States forces launch a major amphibious assault against the last seaport held by the Confederates, Fort Fisher, North Carolina. The Thirteenth Amendment to the United States Constitution (conditional prohibition of slavery and involuntary servitude) passes narrowly, in the House of Representatives. American Civil War: Confederate General Robert E. Lee becomes general-in-chief. American Civil War: Columbia, South Carolina burns, as Confederate forces flee from advancing Union forces. February 3 – American Civil War – Hampton Roads Conference: Union and Confederate leaders discuss peace terms. February 8 & March 8 – Gregor Mendel reads his paper on Experiments on Plant Hybridization at two meetings of the Natural History Society of Brünn in Moravia, subsequently taken to be the origin of the theory of Mendelian inheritance. February 21 – John Deere receives a patent for ploughs. February 22 – Tennessee adopts a new constitution, that abolishes slavery. March 3 – The U.S. Congress authorizes formation of the Bureau of Refugees, Freedmen and Abandoned Lands. March – Hamm's Brewery opens in Milwaukee, Wisconsin. March 4 – Abraham Lincoln is sworn in for a second term as President of the United States. March 4 – Washington College and Jefferson College are merged, to form Washington & Jefferson College. March 19–21 – American Civil War – Battle of Bentonville: Union troops compel Confederate forces to retreat from Four Oaks, North Carolina. The Claywater Meteorite explodes just before reaching ground level in Vernon County, Wisconsin; fragments having a combined mass of 1.5 kg (3.3 lb) are recovered. American Civil War: In Virginia, Confederate forces capture Fort Stedman from the Union. Lee's army suffers heavy casualties: about 2,900, including 1,000 captured in the Union counterattack. Confederate positions are weakened. After the battle, Lee's defeat is only a matter of time. April 9: Appomattox Court House. April 2 – American Civil War: Confederate President Jefferson Davis and most of his Cabinet flee the Confederate capital of Richmond, Virginia, which is taken by Union troops the next day. April 6 – German chemicals producer Badische Anilin- und Sodafabrik (BASF) is founded in Mannheim. April 9 – American Civil War: Confederate States Army General Robert E. Lee surrenders to Union Army General Ulysses S. Grant at Appomattox Court House, effectively ending the American Civil War. Assassination of Abraham Lincoln: President of the United States Abraham Lincoln is shot while attending an evening performance of the farce Our American Cousin at Ford's Theatre in Washington, D.C., by actor and Confederate sympathizer John Wilkes Booth. Doctors move the unconscious President to a bed in a house across the street. United States Secretary of State William H. Seward and his family are attacked in his home, by Lewis Powell. April 15 – President Lincoln dies early this morning from his gunshot wound. Vice President Andrew Johnson becomes the 17th President of the United States, upon Lincoln's death. Johnson is sworn in later that morning. April 18 – Confederate President Jefferson Davis and his entire cabinet arrive in Charlotte, North Carolina, with a contingent of 1,000 soldiers. April 21 – German Chemicals producer BASF moves its headquarters and factories from Mannheim, to the Hemshof District of Ludwigshafen. American Civil War: Confederate States Army General Joseph E. Johnston surrenders to Union Army Major General William Tecumseh Sherman, at Durham Station, North Carolina. The steamboat Sultana, carrying 2,300 passengers, explodes and sinks in the Mississippi River, killing 1,800, mostly Union survivors of the Andersonville Prison. April 27: Steamboat Sultana sinks. May 1 – The Triple Alliance of Argentina, Brazil, and Uruguay against Paraguay is formally signed; the Paraguayan War has already begun. May 4 – American Civil War: Lieutenant General Richard Taylor, commanding all Confederate forces in Alabama, Mississippi, and eastern Louisiana, surrenders his forces to Union General Edward Canby at Citronelle, Alabama, effectively ending all Confederate resistance east of the Mississippi River. May 10 – American Civil War: Jefferson Davis is captured by the Union Army near Irwinville, Georgia. May 12–13 – American Civil War – Battle of Palmito Ranch: In far south Texas, more than a month after Confederate General Lee's surrender, the last land battle of the civil war with casualties, ends with a Confederate victory. The International Telegraph Union is founded. French missionary Father Armand David first observes Père David's deer in Peking, China. May 25 – Mobile magazine explosion: 300 are killed in Mobile, Alabama, when an ordnance depot explodes. May 28 – The Mimosa sets sail with emigrants from Wales for Patagonia. May 29 – American Civil War: President of the United States Andrew Johnson issues a proclamation of general amnesty for most citizens of the former Confederacy. June–August – English polymath Francis Galton formulates eugenics. June 2 – American Civil War: Confederate forces west of the Mississippi River under General Edmund Kirby Smith surrender at Galveston, Texas, under terms negotiated on May 26, becoming the last to do so. June 10 – Richard Wagner's opera Tristan und Isolde debuts at the Munich Court Theatre. June 11 – Battle of the Riachuelo: The Brazilian Navy squadron defeats the Paraguayan Navy. June 19 – American Civil War: Union Major General Gordon Granger lands at Galveston, Texas, and informs the people of Texas of the Emancipation Proclamation (an event celebrated in modern times each year as Juneteenth). June 23 – American Civil War: At Fort Towson in Oklahoma Territory, Confederate General Stand Watie, a Cherokee Indian, surrenders the last significant Rebel army. June 25 – James Hudson Taylor founds the China Inland Mission at Brighton, England. June 26 – Jumbo, a young male African elephant, arrives at London Zoo and becomes a popular attraction. July – The Christian Mission, later renamed The Salvation Army, is founded in Whitechapel, London, by William and Catherine Booth. July 4 – Lewis Carroll publishes his children's novel Alice's Adventures in Wonderland in England (first trade editions in December). The U.S. Secret Service is founded. The first speed limit is introduced in Britain: 2 mph (3.2 km/h) in town and 4 mph (6.4 km/h) in the country. July 7 – Following Abraham Lincoln's assassination on April 14, the four conspirators condemned to death during the trial are hanged, including David Herold, George Atzerodt, Lewis Payne and Mary Surratt. Her son, John Surratt, escapes execution by fleeing to Canada, and ultimately to Egypt. July 14 – First ascent of the Matterhorn: The summit of the Matterhorn in the Alps is reached for the first time, by a party of 7 led by the Englishman Edward Whymper; 4 die in a fall during the descent. July 30: Steamer Brother Jonathan sinks. July 21 – Wild Bill Hickok – Davis Tutt shootout: In the market square of Springfield, Missouri, Wild Bill Hickok shoots Little Dave Tutt dead over a poker debt, in what is regarded as the first true western fast draw showdown. July 23 – The SS Great Eastern departs on a voyage to lay a transatlantic telegraph cable. July 27 – Welsh settlers arrive in Argentina at Chubut Valley. July 31 – The first narrow gauge mainline railway in the world opens at Grandchester, Australia. August 16 – The Dominican Republic regains independence from Spain. August 25 – The Shergotty meteorite Mars meteorite falls in Sherghati, Gaya, Bihar, India. September 19 – Union Business College (now Peirce College) is founded in Philadelphia. September 26 – Champ Ferguson becomes the first person (and one of only two) to be convicted of war crimes for actions taken during the American Civil War, found guilty by a U.S. Army tribunal on 23 charges, arising from the murder of 53 people. He is hanged on October 20, two days after the conviction of Henry Wirz for war crimes. October 11 – Morant Bay rebellion: Paul Bogle leads hundreds of black men and women in a march in Jamaica; the rebellion is brutally suppressed by the British governor Edward John Eyre with 400 executed. October 25 – Florida drafts its constitution in Tallahassee. The Standard Oil Company opens. The paddlewheel steamer SS Republic sinks off the Georgia coast, with a cargo of $400,000 in coins. November 6 – American Civil War: Confederate captain James Waddell surrenders the commerce raider CSS Shenandoah to the British at Liverpool. 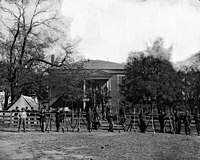 November 10 – Major Henry Wirz, the superintendent of the Confederate prison camp in Andersonville, Georgia, is hanged, becoming the first of two American Civil War soldiers to be executed for war crimes. November 11 – Duar War between Britain and Bhutan ends with the Treaty of Sinchula, in which Bhutan cedes control of its southern passes to Britain in return for an annual subsidy. November 26 – Battle of Papudo: The Spanish ship Covadonga is captured by the Chileans and the Peruvians, north of Valparaíso, Chile. December 11 – The United States Congress creates the United States House Committee on Appropriations and the Committee on Banking and Commerce, reducing the tasks of the House Committee on Ways and Means. December 17 – Leopold II becomes King of the Belgians, following the death (on December 10) of his father, King Leopold I.
December 18 – Secretary Seward declares the Thirteenth Amendment to the United States Constitution ratified by three-quarters of the states (including those in secession) as of December 6; slavery is legally outlawed in the last two slave states of Kentucky and Delaware, and the remaining 45,000 slaves are freed. December 21 – The Kappa Alpha Order is founded at Washington College, Lexington, Virginia. December 24 – Jonathan Shank and Barry Ownby form the Ku Klux Klan in the American South, to resist Reconstruction and intimidate carpetbaggers and scalawags, as well as to repress the freedpeople. The National Temperance Society and Publishing House is founded by James Black in the U.S.
February 17 – Ernst Troeltsch, German theologian (d. 1923). ^ Moore, Randy (May 2001). "The "Rediscovery" of Mendel's Work" (PDF). Bioscene. 27. Archived from the original (PDF) on February 2, 2017. Retrieved December 6, 2016. ^ Coleman, Helen Turnbull Waite (1956). Banners in the Wilderness: The Early Years of Washington and Jefferson College. University of Pittsburgh Press. p. 214. OCLC 2191890. Retrieved April 28, 2011. ^ "Elaphurus davidianus". Ultimate Ungulate. 2004. Archived from the original on June 5, 2011. Retrieved May 5, 2011. ^ Wilkinson, Susan (September 1998). "Welsh immigrants in Patagonia: Mimosa, the old ship that sailed into history". Buenos Aires Herald. Retrieved November 26, 2010. ^ Galton, Francis (1865). "Hereditary talent and character" (PDF). Macmillan's Magazine. 12: 157–166, 318–327. Retrieved December 6, 2016. ^ a b c Everett, Jason M., ed. (2006). "1865". The People's Chronology. Thomson Gale. ^ a b Palmer, Alan; Veronica (1992). The Chronology of British History. London: Century Ltd. p. 286. ISBN 0-7126-5616-2. ^ Cartmell, Donald (2001). The Civil War Book of Lists. Career Press. p. 104.